If you are looking for my NBUS Challenge #5, click here! Thank you to all of you who have already played and left appreciative and supportive comments! I am way behind on commenting, but I have noticed that a lot of you are visiting each other and the sponsors and leaving some love. That makes me very happy and sends Hammy squeeing off the walls! We are halfway through the ten-day NBUS Challenge #5, so head's up if you are intending to join in the fun! Which I sincerely hope you are! It ends at 11:55 PM PST on September 18, 2015. Today I only have a onefer for you. I have several friends with September and October birthdays and I love using My Favorite Things "Splendid Sunflower" Die-Namics die and coordinating stamp for fall birthdays. All the papers are snippets from my stash. The e/f is "Distressed Stripes" by Cuttlebug. The sediment is also MFT from the "LJD Pretty Poppies" set. You knew that sunflowers turn their heads to face the sun throughout the day, but did you know that the sunflower head is actually composed of hundreds of individual flowers joined together? 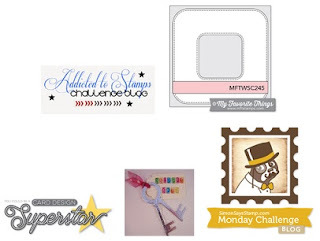 Simon Says Stamp Monday Challenge: Coordinating Dies and Stamps. The Mister came through surgery just fine! I'm not gonna lie, it's a bummer being him, except for he's lucky to have Nurse Nelly shower him with love and attention! I'm happy to report that he has been an excellent patient. Thank you for understanding that I'm a bit scattered and distracted and not managing much time on the computer. And thank you from both of us for the fantastic cards he is receiving! It truly made me giggle out loud! I was so happy I had the camera on the desk so I could take pictures. It was as if this little squirrel friend was expressing sympathy for the Mister's temporarily useless leg! 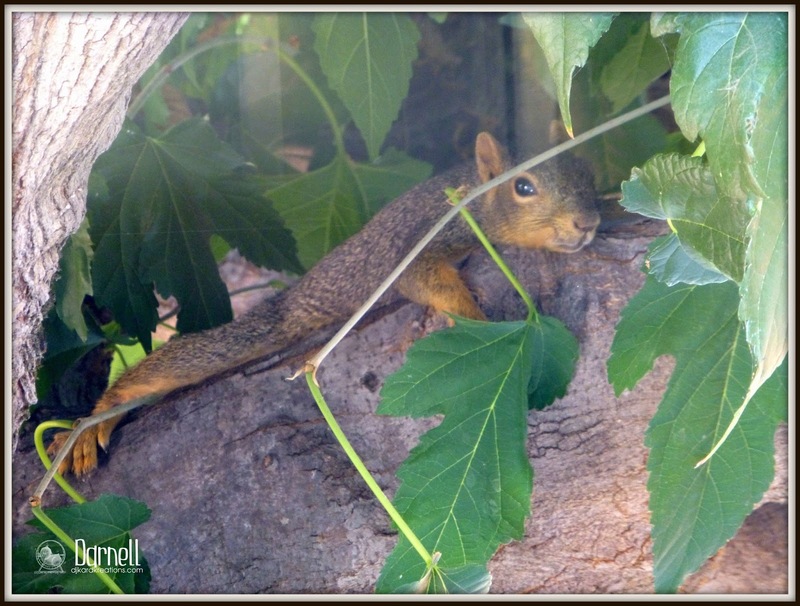 When I stepped out of the Playhouse a few minutes later, the little squirrel just stayed there, only a couple of feet from me. We had a lovely conversation while Hammy watched from inside on the window ledge. It's good for him to see me talking with other furry critters once in a while so he doesn't take me for granite. It's possible I'm battier than normal and we are only on day 4 of a 42-day recovery. Whee! Your card is gorgeous Darnell, the sunflower is stunning and I love the embossed background. I am pleased that Kevin's surgery went well. I hope he makes a speedy recovery, it is indeed very lucky that he has Nurse Nelly to look after him. Thank you for sharing your wonderful photos. Peeking in at your blog while I am on my travels in Germany. Your card is wonderful! That sunflower looks absolutely voluptuous. Glad for the mister (and you) that he is on the mend. I'm certain he is mending faster because of your kind attentions. Glad your hubby is doing well after his op. That Squirrel had the right idea keeping cool. Very glad to hear that your hubby's operation went well and I wish him a full and speedy recovery. Morning Darnell . . . absolutely LOVE your beautiful sunflower card (sunflowers being a fave of mine). Oh, and I chuckled at the flaked out squirrel pic's too. Hilarious. Good to hear that The Mister's surgery has gone well and that (for the time being) Nurse Nelly is in the house. Gorgous card Darnell, love the sunflower - my Dad has a row of them at the bottom of his garden and after they finish flowering he puts the seed heads out for the birds to feed on. Super pics of the squirrel. Love this card, Darnell! Sunflowers remind me of smiles so sunflowers on a card are smiles on paper. Glad to hear that the Mister is doing well. Hi Darnell! So happy to hear the Mister came through the surgery okay and is on the road to recovery. Extra nice that he is being a good patient (so far, at least). You've shared a lovely card with a fact I didn't know. So, thank you for that. Thanks, too, for the funny photos of the squirrel. It had to be hot if he didn't have the energy to run off! Thanks for everything you do, Darnell! You make this blogland a better place, that is for sure! Beautiful sun flower card! They make me smile! Glad to hear your hubby did well with his surgery and I hope he has a speedy recovery! Love the texture of your layered background -- really sets off that happy sunflower! And your little squirrel friend started my day with a smile -- glad you had your camera nearby! This is gorgeous! LOVING the sunflower!!! Glad his surgery went well and loving the squirrel photos!!!!!!!!!!! so glad that all is okay with the mister. What a wonderful card, the colour is perfect, and your design is lovely. What a wonderful stamp and die to own. Lovely photos of the squirrel too. First so happy Kevin came through the surgery okay. It is bad enough to have the surgery but to have endure this gawdawful heat must be unbearable. I was pregnant both times during the summer and it was miserable, especially w/o AC. This sunflower is just wonderful and love the embossed backgrounds! You made me smile so much with this cute squirrel! Sunflowers are my favorite. Yours is spectacular. So glad your DH came through the surgery fine. Wishing him a rapid recovery. I'm so glad Mister is through his surgery and home again. I can't imagine this will be easy but I hope he is not in pain. It will be so boring for him to not be able to do his regular activities but he will be good as new when this is over. Perhaps water skiing is not his thing! I love the sunflower card. It is so bright and cheerful. It's good for Hammy to know you have other furry friends so he will stay in line! Or is that online? Thanks for the update, I have been thinking of you both. Don't worry about comments right now, you are a busy gal. Darnell, so glad The Mister is recovering as well as to be expected! And great that you can take a breather and create something! Thanks for the update! 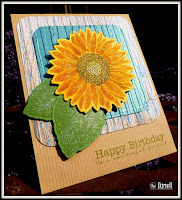 What a beautiful sunflower stamp and die, I can see why you use it for birthdays, it makes such a statement! Hang in there friend, I think the 'fun' is just beginning! What a lovely card Darnell!! I LOVE the papers that you used on the background. SO fun!! I love a sunflower and you've created a beautiful card with this one! Hope the mister continues to improve daily! Gorgeous sunflower!! Glad to hear hubby is recovering well post op and trusting his recovery will be a quick one and he will be a cooperative patient ;) Darling photo of the squirrel LOL! This sunflower image makes for a bright and cheerful card and you embossed background works so well with it. Glad to hear that hubby is recovering well and wish him a speedy one. Lovely squirrel pictures and how great to be able to get so close without spooking him. Gorgeous sunflower card, I have been drooling over that stamp set for a loooong time! So happy to hear that the surgery went well, Darnell! Here's to a speedy (as possible) recovery and know that more thoughts and prayers are coming your way! Your sunflower card is BEAUTIFUL, Darnell! Love the bright cheery bloom atop that fab EF! Can see why you love that sunflower (on my list of favorites). It is spectacular and you've showcased it beautifully. Since it doesn't appear you need a bell for the Mister to summon you, I'm thinking his recovery is going as well as expected, thus far (does anyone say "thus" anymore?). Great photos of the squirrel, who I commiserate with, completely. This weather is hideous plus we have a raging inferno nearby to add to the misery. (Sending prayers to residents and firefighters in that area.) Not surprisingly, your NBUS challenge has taken off like gangbusters(does anyone say that anyore, either? Geez, I'm old.). WOW! By the way, congrats on your Tag Your It! win...well deserved. love those little Mr Squiggle leggies dangling down from the branch! I shall be coming to play in your NBUS challenge in the next day or so-and you have HOW many sponsors??!!! cor ! What a gorgeous card, Darnell and what a lucky friend. Love the fall colors and feel to the card. I'll keep your hubby in my thoughts and prayers. Thanks for the fun challenge. I've found a few things that needed some love that I never used so I am definitely entering. It's very nice of you and your sponsors to give us some fun things to occupy our time. Best wishes for a speedy recovery and patience for you during this time. I know my husband (in the past) has not been a very good patient. But I am gad yours is. Happy weekend. Hang in there. What a beautiful card. That sunflower is so oretty. Glad the mister's surgery went well. He's lucky to have you attending to him. Good to hear the hub's surgery went well and he is recovering. Speedy recovery wishes going to both of you... you will be busy. Love that little squirrel and he actually looks like he was posing for you. The sunflower card is beautiful and I love the colours you used. I don't think I would ever have thought of using the bold blue but it's perfect! The embossing folder also added some great texture. I totally love this card so well done! Stunning sunflower and a fabulous card. Love your sweet squirrel photos....now your little hamster will have company and someone to play with. Your card is just stunning. Such a beautiful sunflower! Your card is so gorgeous. The sunflower is so pretty and love the background panels too. Gorgeous card! Love the beautiful sunflower! Great to hear that Mister is making a nice recovery. I'm thinking that it's all because he has the kindest, sweetest, nicest nurse in the whole wide world....Nurse Nelly! Could that squirrel possible be any cuter! Looks like me a few weeks ago when we had the ca-razy hot temps! Great pics! Awesome card! I love, love, love how you lined up the lines on the blue and white panels (...who me?). The yellow sunflower sure does pop against the vibrant blue! Thanks for the info on the Sunflower. I knew that they turned their heads but had NO idea about te individual flowers! Beautiful card Darnell. Love the pretty sunflower and the colors. Enjoy your weekend and I hope the Mister is doing a lot better. I just entered your NBUS challenge. Wow what a great display of talent in the entries. Darnell, love all your details in this sunflower card. The color combos are fantastic. Did I mention sunflowers are my favorite!!? This most certainly is a splendid sunflower! Sunflowers always make me happy and I'm glad to learn that they are made up of lots of tiny flowers! Makes them even more special! When we had a hot spell a squirrel would stretch out like that on the deck railing near the air conditioners. I think he was taking advantage of the air blowing from the fan. He wouldn't budge when we went out the door. I couldn't blame him. If it weren't for the air conditioning I wouldn't be budging either! TFS the card & the update! Zipped over to catchup on what's going on, and glad to hear all the health stuff is well in hand, and progressing as it should. I know he has excellent care ready to hand. Cute pics of the visitor, and he's keeping cool. How clever he was to poke out that little leg! Also loving the colors & textures on this bold & beautiful sunflower. Looks like lots of texture in the flower itself, as well as the background treatments. Most wonderful to enjoy and your friends will be delighted to receive its beauty! Hugs to you both (and Hammy)..hope the wkend is quiet & healing. TFS & Hugs. (not made to NBUS yet but trying). Glad to hear your hubby is doing well. I'm sure the 42 days will fly by. Love the sunflower card Darnell. Happy to hear your hubby is recovering well. Will keep him in prayer. Squirrels are not my favorite critters. They are very destructive in our area. Have to admit they can be real clowns at times. A lovely,bright, happy card. So glad Mister is recovering well, now lets hope we can say the same for your sanity after the 42 days! Your card is gorgeous!!! 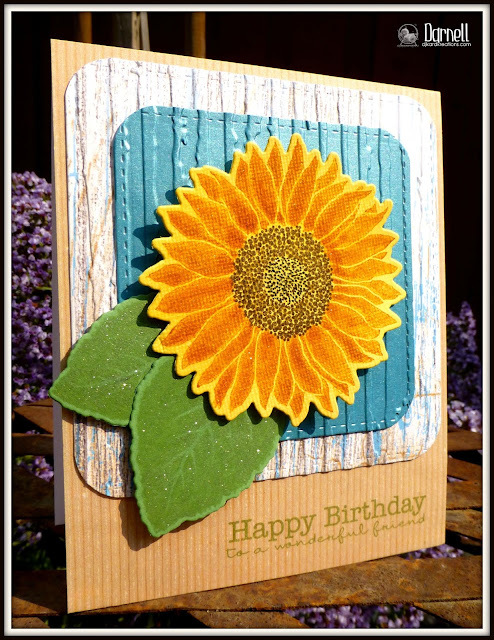 Love the beautiful sunflower on that woodgrain embossed background! Glad to hear hubby is doing well. You know those men...big babies, sometimes. And that little squirrel is a hoot!!! PRETTY card Darnell, so happy!! So happy to hear that Mister is doing well. Day four huh...good luck sweet friend!! 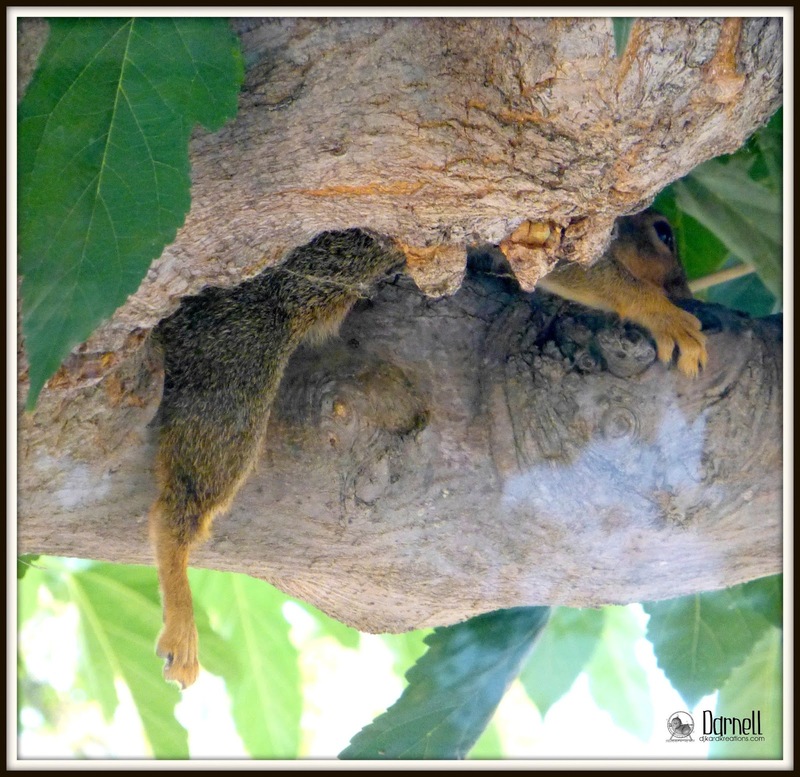 What fun photos of the squirrel, poor little dude suffering through the heat! I have a card ready fro the challenge, just have to get all of the photo stuff done. Take care ~ hugs! Love the rich colors and tones this beautiful card has - and I am loving all the yummy texture that makes it so dynamic!! Super awesome an just such a sight to see!!! Loved seeing your squirrel pics - you could be a professional nature photographer!!! Hope the rest of your weekend is INCREDIBLE - just like you are!!! Love that big sunflower and the double layered Distress Stripes, Darnell. Don't you just love squirrels. They lay flat, not moving, thinking we can't see them if they don't. Silly things. Glad Mister's coming along. This may be a looonnngg Fall. Your sunny sunflower brightened my day! So pretty with the embossed background! Good to hear that the surgery went well and Mister is behaving, so far! Great news to know Mister is being a good patient and Nurse Nelly is showering him with love :-) ... even if somebody is going batty.... ;-). Love your bright and cheerful card Darnell. Oh what fun photos!! I would have laughed too! Beautiful card - love the texture in you BG and I'm soooo glad the Mister is on the mend ... Wishing you happy days ahead! What a fun card! Those photos are a riot! Glad to hear your husband is doing ok.
LOVE the beautiful sunflower and all the texture you included. That squirrel is so funny! I do think he's passing along his sympathy for your poor husband! Thanks for the update! He remains in my thoughts & prayers. You, too! That's a LONG recovery period! Fabulous sunflower card! I never can resist a sunflower stamp or die, I ought to use mine more often. Dear Darnell, I'm happy to hear good news about Mister's health. All the best for him and for you! Your sunflower card is positive and wonderful in strong colours. I really like it! Beautiful card Dolly! Glad you had a little time to play. Ah I do love Sunflowers! My aunty has one in her garden that is 7ft6!! This is a stunning card! I really thought it was clever of you to combine the rustic sunflower with the worn wood background paper. I also like that it has a double mat instead of just one. The colors are so vibrant and hopeful and I love the thought of this happy sunflower for birthdays any time of the year! Excellent work and I'm so glad you shared it with us for this week's Simon Says Stamp Monday Challenge! Beautiful card, Darnell! Love that big sunflower! Glad to hear everything went good with your husbands surgery! And what fun pics! I love sunflowers and make a sunflower card for my sister Stephanie every year. She loves them as much as I do. Very pretty card. I'm going to bookmark this post for future reference. Squirrels make me laugh, even though they drive our dog nuts! Your card looks so sunny and has great layers! Fabulous card, Darnell! I'm so glad "the mister" is doing well and is such a great patient. I wish him the speediest recovery possible! Gorgeous card and I am loving the photo of your little shady squirrel friend! My daughter and son both live in hotter areas than I and had temps of over 100 degrees (Livermore and Sacramento...argh!). No thank you! I do assume you have A/C in your playhouse or I'm sure your ink pads would be melting into puddles! Glad to hear the Mister is through surgery but now comes the hard part. Hope his recovery is uneventful and quick! Love sunflowers and love yours! Great textured background and beautiful sunny and shimmery petals! Gorgeous sunflower with the shimmer! I love it. And squirrels are so cute when they aren't tormenting my dog. :) Glad to hear your husband did well with his surgery. Hope his recovery is swift! So glad the Mister's surgery went well and that he's being good, so far. Hope that continues! The card is gorgeous, as always and the pix of the adorable squirrel are great too! Glad to hear the Mister is now on the road to recovery - and hope you are not on the road to exhaustion!! What a gorgeous card with the pretty sqaure panels and beautiful bloom! 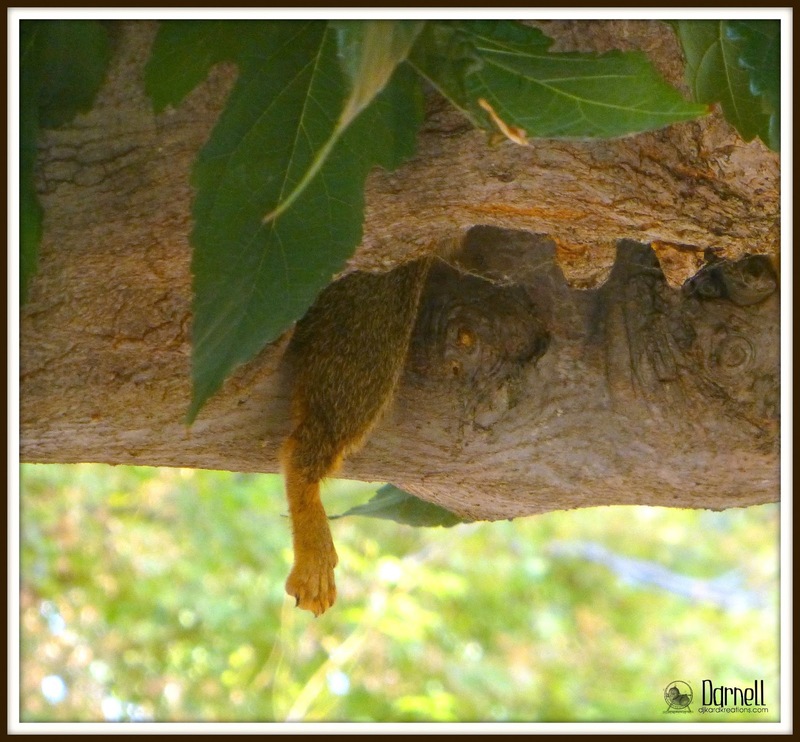 Love your sweet litle squirrel lazing on the tree branch - what a fun companion in your yard! So, so glad to hear The Mister is doing well--relatively speaking, of course, & glad Nurse Nellie has been there rather than Nurse Ratchet! Thinking of you both & wishing you some relief from the heat! We've finally cooled down with clouds & rain in the forecast, so maybe I really am still in Oregon! Your photos are completely amazing & wonderful, Darnell! and I joined your NBUS too if you have 1 pr 2 minutes time so happy if you can look my card..
Hi there Darnell, flabby post as usual,and so very gla dhubby came through it all so well, and yes a, sure you're a super nurse in caring for him..
Love the sunflower card, so cheery, don't know they were made up many flowers.... And well the squirrel takes the cake, what smart critter he is ... Clever squirrel, after all who'd want a furry coat on hot summers day. What a glorious card Darnell! I'm so happy you managed to snap a few pictures of this cute squirrel! Wow, your sunflower card is so vibrant, Darnell. Love it! Happy to hear surgery went well so you can fully concentrate on his recovery now. Over here, hubby is doing fine except for being tired, but he has a strong will which can be sth. positive as long as he doesn't forget listening to his body. Still, we're keeping the medical profession in business, since we have both developed a rash and I'm also keeping the local physiotherapist in business with my frozen shoulder. On a happier note, temperatures are finally going down, so I'm looking forward to a relatively cool bedroom tonight. Gorgeous 'splendid' sunflower Darnell; easy to see why it's your "go to" image for fall birthdays! The blue embossed panel adds to the WOW factor! As for poor Mr. Splayed Out Squirrel: cute, but feeling for him! Hopefully a shady tree keeps him comfy; can't be fun wearing a fur coat in +100 temperatures. Great to hear that Mister is on the mend and I'm sure he's quite enjoying the attention you're lavishing on him. Hmmm...might that lead him to 'extend' his recovery time *grin* Hopefully the 'bats' will stay away! You are just toooo funny! I love your sunflower with the sparkly leaves and bold bright color. 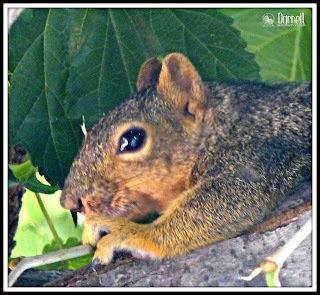 I'm with that little squirrel.. dang its hot out! Hes so silly! Loving that big bold flower and the fantastic texture you added! What a great take on the sketch, so glad you played along! That sunflower just has to make you smile, as does the poor hot squirrel. Not smiling at his misery, just his contortions. Gorgeous card, sunflowers always brighten the day! Brilliant card. I love that distressed stripes e/f it really adds a fab background to your sunny flower !!! I keep coming back to look at this card Darnell, just love that stamp and die and at first I thought you had used special paper/card as it looks so velvety/velvet like. I adore Sunflowers they just scream summer and warmth to me and this card does that too.